TOKYO — At about 1 p.m., the Tokyo Dome’s outside concourse was abuzz with baseball fans avoiding their jobs and responsibility — an opening-day tradition that can be found even in Japan’s work-first culture. First pitch still was six hours away, but the celebration already had started. Lines of fans waited outside merchandise tents to spend 8,000 yen — about $72 — on a sweatshirt, or double that on an Ichiro jersey. Near the entrance to the first-come, first-served general admission outfield seats, fans had shown up in the morning to place signs marking their place in line for when the doors finally opened for batting practice. The placeholders — hundreds of them, similar to the tent cities college students set up for rivalry basketball and football games — wrapped around the roped-off area. Once the doors opened, fans sprinted to get spots along the fence, hoping to get any players’ pictures and autographs, but one in particular — Ichiro. They screamed for him, held signs and documented his every move with their phones. While Major League Baseball treats this opening series in Japan as a celebration of the game and an effort to spread its popularity, a hint to MLB — baseball already wildly popular in Japan. If you think opening day in the U.S. is big, the excitement in the Tokyo Dome exceeds it. 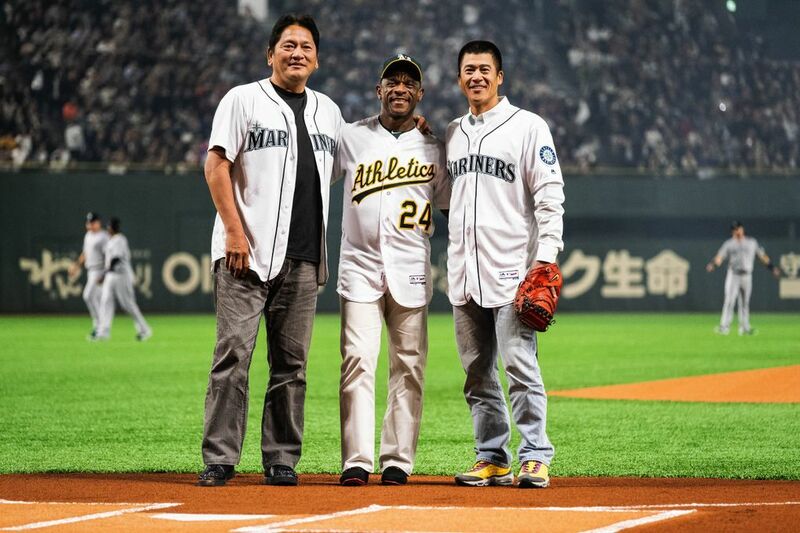 They did all the pregame pageantry with a U.S. Military band and a ceremonial first pitch that featured Seattle’s former All-Star closer Kaz Sasaki throwing to former Mariners catcher Kenji Johjima, with former A’s great Rickey Henderson at the plate. A real home team wasn’t even playing in this game, but the Mariners were the favorite due to Ichiro’s presence. Fans in Japan have an energy and intensity that doesn’t always permeate U.S. crowds. Last season, Mitch Haniger played a series with an MLB all-star team against Samurai Japan — the Japanese national team — so he’s seen the difference. That same intensity was still there Wednesday, even with two U.S. teams playing. Stone | Mariners know 2019 will be rough. But a tantalizing future isn't far off. Mariners second baseman Dee Gordon best summed up the sojourn in Tokyo that has included two exhibition games and a regular-season game, with one more to come Thursday. Regardless of what MLB might think, this is a celebration of Ichiro’s career. Indeed, there is Ichiro fatigue on this trip. Fans, media and an entire nation want to see him launch one of those patented line drives into left-center or a hard ground ball through the right side. He’s been unable to do that thus far. A crowd of 45,787 roared when his name was announced as part of the starting lineup, again when he raced around the outfield to his spot in right field and even when he hit hard foul balls. Getting the start in right field, he went 0 for 1 with a walk in two plate appearances. For each at-bat, probably 70 percent of fans were holding their phones, recording a possible piece of history — and perhaps hit No. 3,090. At age 45, he was the second-oldest position player to start on opening day. Ichiro played 3½ innings before taking the field for the bottom of the fourth. Before the half-inning started, Servais sent out Daniel Vogelbach to play first base and had Jay Bruce move to right field to replace Ichiro. The manager had provided a moment for fans to cheer Ichiro, but it didn’t work quite as planned. Fans didn’t understand what was going on. 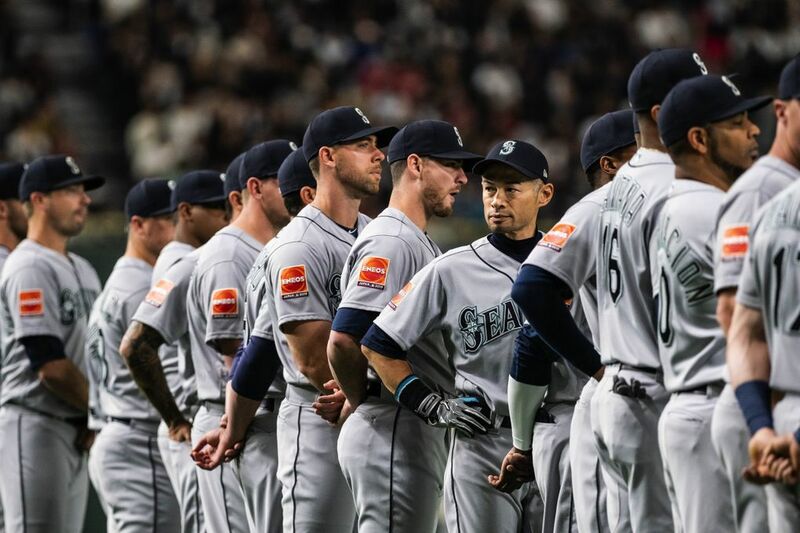 When Ichiro started hugging teammates as he exited the field near the third-base line, fans began to understand he was coming out of the game, and many then applauded. Servais had never planned on playing Ichiro the entire game. The plan is for Ichiro to play in the series finale Thursday, but Servais wouldn’t commit to a specific role — starting or coming off the bench — only that he would play. “He will get in the game at some point,” Servais said. 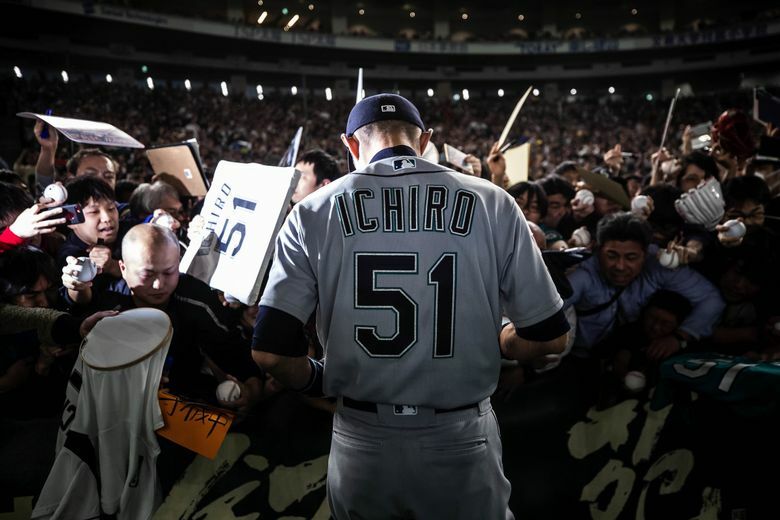 That game will offer a glimpse of Japanese baseball’s past in Ichiro, but also a long look at its future, with left-hander Yusei Kikuchi starting for the Mariners and becoming the first Japanese-born player to make his MLB debut in Japan.